Abstract: The authors present a model for circadian oscillations of the Period (PER) and Timeless (TIM) proteins in Drosophila. 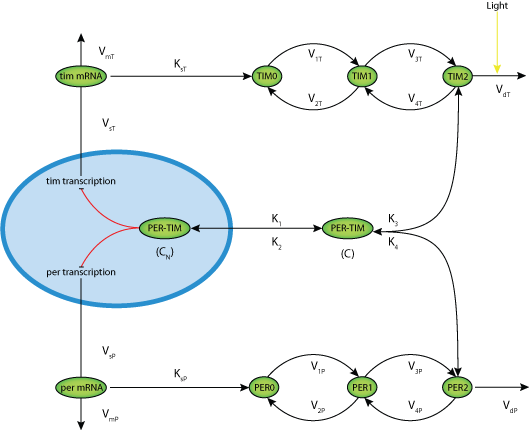 The model for the circadian clock is based on multiple phosphorylation of PER and TIM and on the negative feedback exerted by a nuclear PER-TIM complex on the transcription of the perand tim genes. Periodic behavior occurs in a large domain of parameter space in the form of limit cycle oscillations. These sustained oscillations occur in conditions corresponding to continuous darkness or to entrainment by light-dark cycles and are in good agreement with experimental observations on the temporal variations of PER and TIM and of per and tim mRNAs. Birhythmicity (coexistence of two periodic regimes) and aperiodic oscillations (chaos) occur in a restricted range of parameter values. The results are compared to the predictions of a model based on the sole regulation by PER. Both the formation of a complex between PER and TIM and protein phosphorylation are found to favor oscillatory behavior. Determining how the period depends on several key parameters allows us to test possible molecular explanations proposed for the altered period in the perl and pers mutants. The extended model further allows the construction of phase-response curves based on the light-induced triggering of TIM degradation. These curves, established as a function of both the duration and magnitude of the effect of a light pulse, match the phase-response curves obtained experimentally in the wild type and pers mutant of Drosophila. Scheme of the model for circadian oscillations in Drosophila involving negative regulation of gene expression by PER and TIM. per (MP) and tim (MT) mRNAs are synthesized in the nucleus and transferred into the cytosol, where they accumulate at the maximum rates vsP and vsT, respectively. There they are degraded enzymatically at the maximum rates, vmP and vmT, with the Michaelis constants, KmP and KmT. The rates of synthesis of the PER and TIM proteins, respectively proportional to MP and MT, are characterized by the apparent first-order rate constants ksP and ksT. Parameters ViP (ViT) and KiP (KiT) (i = 1, . . . 4) denote the maximum rate and Michaelis constant of the kinase(s) and phosphatase(s) involved in the reversible phosphorylation of P0 (T0) into P1 (T1) and P1 (T1) into P2 (T2), respectively. The fully phosphorylated forms (P2 and T2) are degraded by enzymes of maximum rate vdP and vdT and of Michaelis constants KdP and KdT and reversibly form a complex C (association and dissociation are characterized by the rate constants k3 and k4), which is transported into the nucleus at a rate characterized by the apparent first-order rate constant k1. Transport of the nuclear form of the PER-TIM complex (CN) into the cytosol is characterized by the apparent first-order rate constant k2. The negative feedback exerted by the nuclear PER-TIM complex on per and tim transcription is described by an equation of the Hill type (see first terms in Equations 1a and 1e) in which n denotes the degree of cooperativity and KIP and KIT are the threshold constants for repression. Derived from workspace Leloup, Goldbeter, 1998 at changeset 5bf261df270e. © 2001-2019 - The CellML Project.